Recently I had the opportunity to try out three games from HABA, one of the oldest toy makers in Germany. The Australian company, Let’s Play Games, distributes HABA products in Australia. The three games I received from them were: Zitternix, Mix and Match Robbers, and Animal Upon Animal. 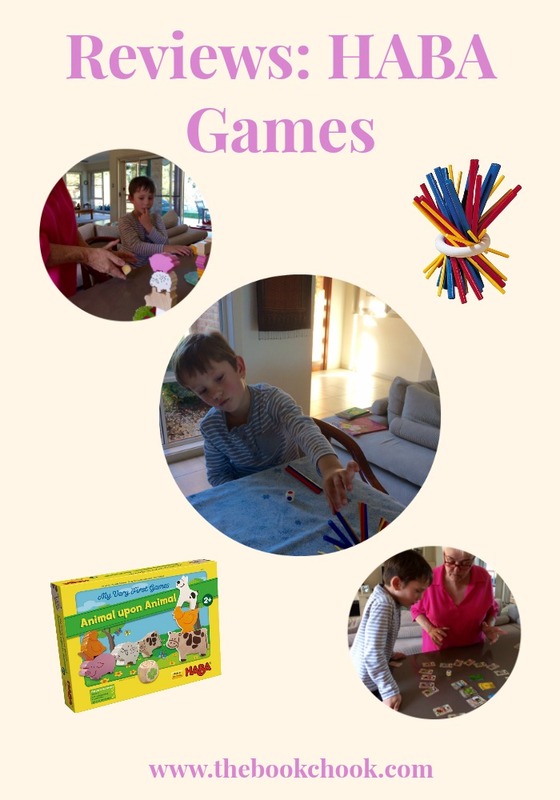 Many HABA games state they are suitable for players between 4 and 99, so I tested the games on four people within the target age range - the youngest was 5 and the eldest was 72. The first thing that struck me about all three games was the colourful, strong, sturdy boxes they came in! This is a huge plus, especially if the games are being purchased for schools. Each game comes with directions (in English and other languages) and those directions are clear. I loved the fact that the games provided ways for a range of ages to play a game while the younger one learnt about turn-taking, following rules and socialising with adults. I also enjoyed the sense of humour evident in the games: for example, instead of a regular way of choosing who goes first, we had to see who could moo the loudest! My overwhelming opinion after playing these games several times, is that they are well-made, educational, and fun. Zitternix is simple, but so entertaining, and able to be played with real enjoyment by older and younger people. It’s a little like fiddlesticks, but made more interesting by a ring to confine the red, blue and yellow sticks, and a special die to stipulate your colour. The strong plastic yellow, red and blue sticks themselves are worth different points, meaning kids get to practise adding their score when the game is over. The fun comes in trying to work out how to remove a stick from the bunch without toppling the structure. Kids are learning lots about balance and practising their critical thinking while doing this. I would certainly recommend Zitternix to families who want something that can be enjoyed across generations, and also to classrooms. I can see it being a success as mixed-age activity in the library or in Peer Support. I loved this game as an adult and certainly could have played it for a long time without getting bored. The game doesn’t take up much space as it is only the bunch of sticks, ring and die, but it is better played on a cloth than a shiny surface. Animal Upon Animal is a great mix - it can be played as several different games, but kids can also use the large animal pieces for free play. The fun comes in balancing the very cleverly constructed animal pieces. Our youngest player enjoyed the games and interaction with other players, but also spent time just experimenting with balance and position of different pieces. He also admitted: “I was a little bit cheeky - I liked making it tricky for everyone else.” I really liked that HABA had created three different games to play with the set, and that the games had few rules that were also easy to grasp. The advice is for this game to be played by children 2+. I think it would be better with kids 4+, but two-year-olds could certainly participate with help. Again, I think this would make a good choice for the classroom or any situation where you want kids to have access to a game especially designed for kids. As opposed to a game for kids that is essentially a modified adult game. Mix and Match Robbers is the game I ranked third on my enjoyment scale, but our five-year-old loved it. Why? “Because I won!” What I did like about it was its portability, making it a good game for families and for travel. The cards inside are quite small, making shuffling trickier I think, but since many of the cards need to be laid out in a circle, it makes sense too - otherwise the game would take up too much space. The fun part comes from assembling heads, torsos and legs to create shady characters - the robbers. The game is really good for practising visual discrimination, because once one character is built, players then have to quickly identify its match in the circle cards. I think it will challenge many children because of this. Our youngster didn’t find it repetitive or tedious, but we older folk did. When my son was young, I certainly bought cheap toys at times. Usually the purchase was an impulse, or the result of persistent lobbying from my son. But I valued high-quality toys too, and would save for these purchases, knowing the products tended to be well-designed and robust, would stand up to lots of playing, and hold his interest for ages. The three HABA games above that I have been testing seem to me to be of excellent quality, and their prices seem commensurate with that. When we play board and card games with our kids, we are not only creating great memories, we are giving our children the gift of our time. Board games make a great choice for holidays, rainy weekends and for anytime - especially for those times you want to avoid screen-based entertainment, and enjoy laughing together. Find Children's Book Reviews at The Book Chook by clicking Reviews in the right sidebar. Check out my iPad App Reviews on Pinterest, and find more apps and articles via my Listly page.